As I sit in my house working this evening, the wonderful smell of a roasting chicken fills my nose; it’s tantalizing and delicious and I know it’s going to be a good dinner. The best part is that I don’t have to eat this wonderful dinner alone, I get to eat it with 6 other friends. Is it a special occasion? Nope, just a regular weekday night; this is the beauty of a house meal rotation. Tons of time actually. Instead of having to cook every night you only have to cook once a week at most, sure that one time you do cook might take a little longer (7 people means a lot of chopping) but ultimately you save yourself a ton of time. Making one big meal is much cheaper than many single servings. Any ingredients you buy can be bought in bulk and the food goes a lot further. It saves you tons of money. Say goodbye to frozen pizza and hotdogs, you’ve only got one night to cook every week or two so you better make it count. Assuming everyone else thinks that way too, you can immediately see why you eat better. People make delicious meals and you get to eat those delicious meals every night. Burrito bowls, Roast Chicken, Stir Fry, Tacos and more have all been made at my house for meal rotation. So say goodbye to unhealthy, frozen, store-bought meals and say hello to some delicious, home-cooked meals, it’s like going home for the weekend every night. Take that Blue Apron. This one is probably my personal favourite part, because rather than everyone cooking at different times and eating alone, we all make an effort to sit down and eat together. You get to hear from everyone and build community within your house. At the same time it is a perfect opportunity to discuss any house issues with everyone, problems get addressed much earlier and living together as a whole becomes much more harmonious (this is important when 7 people live together). Now it’s not all peaches and cream, there are some definite challenges involved. If anyone has dietary restrictions things can become much more difficult. Also people’s tastes and preferences differ wildly and sometimes the food turns out poorly; there is definitely a learning curve in learning how to cook in larger quantities. Finally what about people who’s schedule doesn’t work for the meal? They get saved a meal-sized portion of leftovers for them to eat when they want, then any leftovers after that go to the chef (I often make extra deliberately for me to take to work). Overall, if your household can overcome the challenges involved, a meal rotation can make your life a lot easier and healthier. It takes an open mind, an open palate, and a willingness to experiment but if you do start a meal rotation I promise you, you won’t regret it. 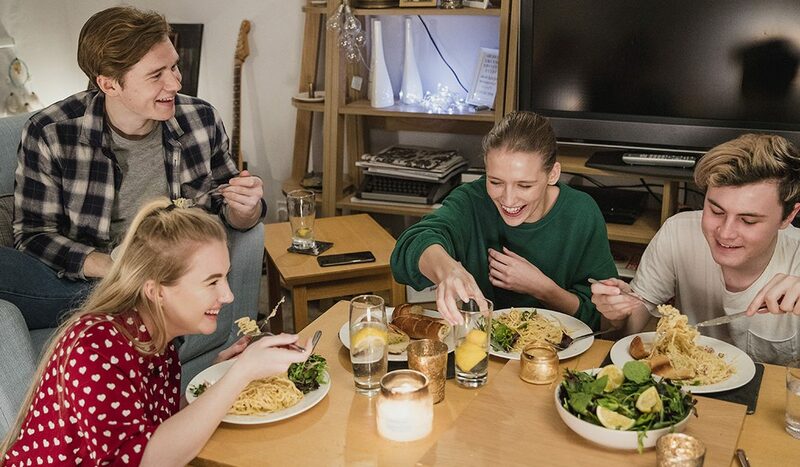 So talk to your housemates and start making dinner your favourite part of the day!